Read the full story on the MTB Project Journal website. Thirty-one days, 8 hours, 33 minutes later, the 33-year-old returned to his front porch—and set a new record in the process. Joe ran-hiked close to 400 miles to reach every summit and pedaled nearly three times that distance to reach each trailhead. I caught up with Joe to learn about his bike setup and how he got his start in self-supported endurance rides. MT: How did you get into long-distance biking? JG: I grew up bike commuting as a kid and used a bike in a utilitarian way for many years but didn’t consider myself a cyclist. Then, in 2006, I flew back to Philadelphia from visiting my parents in France. My wife and I were living in Eugene. I had a six-week window between jobs and decided not to take my connecting flight in the U.S. I went to downtown Philly, bought a bike and rode it home. That transcontinental ride was my introduction. It was casual, but I learned a lot and it was a super awesome experience. MT: Was that 4,200-mile trip a catalyst for long adventure tours? JG: As much as the trip was super transformation and I enjoyed traveling by bike, I went back to using the bike for commuting. At that point, I’d ride my bike a lot but not any long distance like that again. I got into running, though, pretty full on. That bike ride really kickstarted my running career; from that point, I started doing more races and running a lot more. MT: So—biking was actually a part of your life before running? JG: In a weird way, biking was a gateway into ultra-distance running. At the end of the trip from Philly to Eugene, I was fit, skinny, and felt great. We’d just moved to Oregon, and I signed up for the Where’s Waldo 100K (now renamed Waldo 100K). Although, I had done long distance running before I’d done an official event. MT: It’s cool how endurance running and biking seem to really compliment one another for your goals. Tell us about your bike fleet and how you chose your ride for the 14ers project. JG: Last year, I got involved with Reeb Cycles in Longmont—which aligned with the local, self-empowered exploration concept—and got the Sam’s Pants: a bike designed for monster cross (a cross bike with 2-inch tires). It’s a versatile rig and perfect for where I live with dirt roads and trails. The week I got the bike, I did the Colorado Trail Race, which was my first time riding real mountain bike terrain. It was super fun, I had an amazing time, and I got pretty worked. The Colorado Trail is really a technical trail. Doing it on a rigid bike with drop bars is quite strenuous. 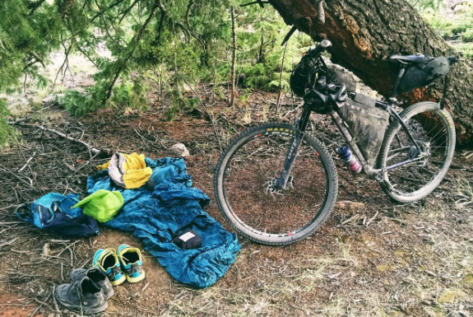 This year—in preparation for Tour de 14ers—I rode the 750-mile Arizona Trail Race, in April. I swapped out my Sam’s Pants for the Dikyelous, Reeb’s hardtail mountain bike. 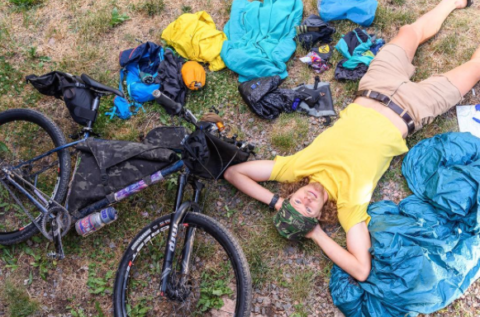 I love Sam’s Pants but the Dikyelous suited my needs better for Tour de 14ers, because I could ride more aggressive trails and it expands the options a little bit. I also have a Surly Pugsley fat bike, and I still have the bike that I rode across the country—I don’t think I can ever sell that rig. It’s a Bianchi Volpe; it has a relaxed frame and is quite well suited for touring; and it was stolen when I moved to Portland the year following that transcontinental ride. I bought another bike and three months later I saw the Bianchi outside a bar. I waited, this chick showed up, and she’d bought it off of Craigslist. So, it came back to me. Everything I’d ridden to that point was road and very light dirt trail-paths. MT: Why was the Reeb Dikyleous most fitting for Tour de 14ers? JG: The Dikyleous is hand-built in Longmont. I personally really like the full circle of tying in local craftsmanship to a local, self-powered trip. In terms of the components, the Rohloff Speedhub internal gearing system and Gates Carbon Drive drivetrain have a really wide range of gears with virtually zero maintenance. You don’t have to oil the belt. I like diminishing the amount of stuff that needs to be dealt with on trail, particularly when you’re tired. As well, having a wide range in gears was helpful for riding a loaded bike: it’s nice to pedal uphill on steep terrain in a low gear, and then on flats open it up into a high gear. On the front, I had a SON (Schmidts Original Nabendynamo) Dynamo Hub, which basically gives me light at night, and a USB adapter enabled me to charge my phone, electronics, and headlamps. MT: What lights did you use? JG: On my handlebars, I used a K-Lite, a cool, low profile, really powerful 1200-lumen light—it’s bright. I’d use a backup headlamp to get depth perception: When you make turns, your handlebars illuminate the trails and might point in another direction than where you want to go. A light on the helmet allows you to turn your head and light up your projected path. Also, when you’re hiking uphill and pushing the bike the output is much lower, because you’re not pedaling as fast; the Dynamo has its limitations, but it’s a practical, durable system. A trick I found was to charge a Goal Zero charger, then charge my phone off of that, and leave my phone in airplane mode to use less energy. I also carried an Anchor external battery, which can charge a phone 10 times. MT: For tires, what was your top pick? JG: I rode Maxxis Crossmark 29 x 2.1 tires—a nice versatile tire—because there would be a decent portion of dirt road and pavement with low rolling resistance. They rolled well on smooth roads and did well on the trail. On the Dikyelous for the Arizona Trail Race, I rode the Maxxis Ardent 29 x 2.4 tires, which are a bit heftier. They are great tires. I had no issues with them on the ATR where there are cacti all over the place. If it’s not broken, why change it? They gave me a sense of confidence. MT: What tools did you carry in your kit? JG: I carried a spare tube, 4oz Stan’s (tubeless tire sealant), spare valve core, mini leatherman multi-tool, multi-tool, super glue, duct tape, tire patches, hand pump, spare front and rear spokes, and the spare belt. MT: Seems like your rig was pretty dialed and bomb-proof. That said, did you have any mechanical problems along the way? 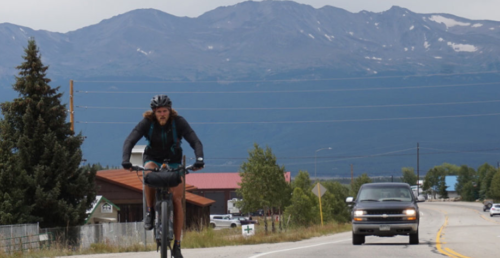 JG: After the Maroon Bells, I was riding back into Aspen and my tire was pretty much flat—I had a torn sidewall really close to the rim, so it was tricky to patch. I put patches and super glue on it, pumped it up 5 or 6 times, got to Aspen (10 miles away), and was lucky that a bike shop had a similar Maxxis tire for me. A week after the Blanca group, I dented my rim really badly. I spent two days in Alamosa getting the rim rebuilt. And I wore the belt out halfway through the 14ers Tour, so I switched it—I’d ridden the same drivetrain since the Colorado Trail Race and the Arizona Trail Race. It probably had 4,ooo miles on it, which is pretty solid. MT: You had custom gear bags, correct? JG: I used Oveja Negra custom-built frame and handlebar bags, made in Salida. I also got a top tube bag and a saddle bag. MT: How did you organize the bike load? JG: The handlebar bag (8 liters) is basically a dry sack with my bivy sack and sleeping bag. The frame bag, about 12 liters, had three compartments with bike tools, spare batteries, food—heavy stuff—at the bottom, and a side zipper pocket with paper maps where I put my phone and things that I could get to on-the-go. The top tube bag (extra large) had just food. The saddle bag carried all of my clothes: puff pants and jacket, spare socks and buff, and rain gear. MT: When is was time to go for a summit, what’d you do with your bike? 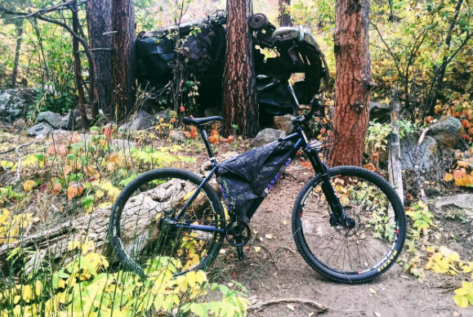 JG: My approach was ‘out of sight out of mind,’ so I would stash the bike 50 feet off the trail in the trees and use a very basic cable lock—really because it’s a bit more of a pain, but if someone is going to steal the bike there’s nothing I can do. I’m not going to carry a U-lock. Thankfully I had no issues. I didn’t want a bear to tear up my bags, so I would hang my food to avoid that situation—it’s also bad practice to attract wildlife in that way, and I was so dependent on that food. At one point, a rodent nibbled a bit of my one of my bags (there must have been a few crumbs left in bag) but I patched the holes up. MT: Once you were riding off pavement, was the priority always the fastest way from point A to B or scenic dirt? JG: The priority was, mostly, what seemed to be the most logical route. The way the peaks are organized in clusters you don’t have a million choices; you can make small changes. In general, I’d want an aesthetic loop—to avoid highways and paved roads—but if the route felt really contrived then I wouldn’t do it. One example is after I did the Elk Mountains. I was going to leave Aspen, ride to Basalt and take Hagerman Pass road, a nice dirt road. Instead, I decided to ride back over Independence Pass and ride the Colorado Trail to Mount Massive. It’s shorter and dropped me into the right spot. Even though I was repeating the aesthetics of an out-and-back on Independence, it was more logical. Also, the shortest distance isn’t always the fastest. I found in a couple of spots it might be 30 miles on dirt or 60 miles on pavement, and would take the same amount of time. Plus, you don’t always know how bad the roads are going to be. When shortcuts worked out, those were amazing.